Are you looking for free, outdoor Concerts this summer? Outdoor concerts are a staple summer activity. Our list below includes Ann Arbor Summer Concert Series (as well as concert series in all of Washtenaw County). I’ve collaborated with other sites in Metro Detroit to bring you a list of concert series throughout the area. 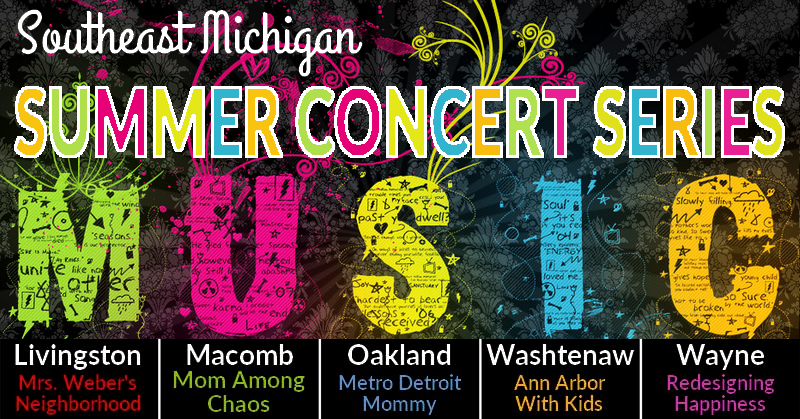 I’ve listed the Ann Arbor Summer Concert Series by Start Date followed by the Summer Concert Series in surrounding communities. Note most of the summer 2019 concerts have not yet been announced. We will update as concerts are announced. Ann Arbor’s Sonic Lunch sponsored by Bank of Ann Arbor kicks off on Thursday, June 1 2018 and runs through the end of August (taking a break for Art Fair). Ann Arbor Summer Festival’s Top of the Park is my favorite outdoor concert event. It runs for 2.5 weeks from June 14 through July 7 with concerts every night except Monday. Music typically starts at 6p on the Grove stage and at 7p on the Rackham stage although it starts as early as 5p on some days. Be sure to check our Top of the Park Kids Guide (2019 information coming soon) for information on all the fun at Top of the Park. This includes the KidZone Tents, Movie Listings, and other activities. The University of Michigan holds a Summer Carillon Concert Series with performances at both Burton Tower (Bell Tower on Ingalls Mall) and Lurie Tower (on North Campus). They are select Mondays at 7p. Ann Arbor Civic Band holds a series of concerts on Wednesday evenings in the summer. Concerts are free. Bring your own blanket or chairs. Three years ago my daughter and I had fun at the Children’s Concert. Ann Arbor Parks hosts free concerts on Sunday afternoons at 3p in Burns Park. The concerts are free, but donations of canned goods and other non-perishable food for Community Action Network (CAN) are appreciated. Check out our playground profile of Burns Park. Head to Chelsea for Sounds & Sights on Thursday night from 6:30-8:30p. There are musical and other performances throughout downtown. Once school lets out, the event ends with a movie at dusk. The 2019 series starts on June 6 and ends on August 15. The Manchester Gazebo Concerts are held on Thursday nights from 7:30-9p. The series starts on June 14 and runs through August 9. The Dexter Summer Music Series is held on Fridays at Monument Park. The 2018 series starts on June 16 and runs through August 25.